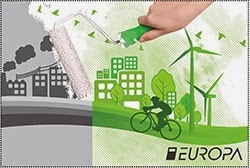 "Ecology in Europe - Think Green"
Interesting blog I have a lot of information found in them, thanks! Netherlands: In the latest update of the 2016 stamp program the Europa issue will become a sheet of 10 different stamps. What's the matter with the UK Post? This year, again, they won't participate? Are you from Moldova? I need the stamps. I see no Europa Stamps from Turkey. But it released at 09/05/2016. Concerning Turkey - I won't publish the Turkish stamps issued in my May on the theme "Think green" on my blog as I don't consider them as "Europa stamps" ! Turkey this year don't use the official Europa logo nor the word Europa which don't make their issue a Europa stamp issue. I'm Portuguese collector. I have interests in Europa CEPT in general. I would like to issue a challenge to all those who share this interest. My challenge is to send letters with Europe CEPT stamps of our countries and a good cancellation (postmark). To do this, simply interested send a email with your mail address and of course, commit to sending.